How do I perform a reset of my Live Pen™ 1? There are two kinds of reset. A soft reset will just restart the pen. In certain circumstances it is necessary to reset a pen back to it's factory defaults. Carrying out this procedure will remove all user data from the pen, including all pen strokes and Bluetooth pairings. Remove the pen lid and hold the pen vertically with the point touching a blank piece of ordinary (non-patterned) paper. 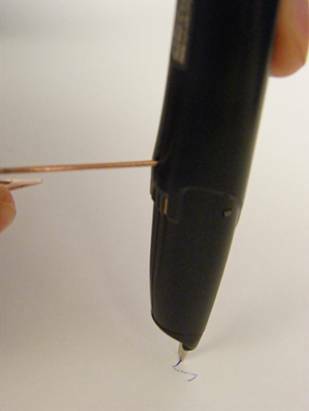 Use a paper clip, or something similar) to gently depress the reset button (on the label side of the pen, just below the cap) and hold it for at least 3 seconds. Do not remove the pen from the paper. Continue to apply downward pressure and remove the paper clip. Wait for the three LEDs to stop flashing and two should change to a solid yellow state. Remove the pen from the paper. It will pause briefly and then vibrate three times to indicate a successful hard reset. The pen will need to be repaired with your mobile device and other setting re-done.